Shimmering Magic: A Winter Wonderland... in a Jar! You are at:Home»Magazine»Shimmering Magic: A Winter Wonderland… in a Jar! Shimmering Magic: A Winter Wonderland… in a Jar! Homemade snow globes are great decorations at any time of the year, while the miniature wintry scene makes it an especially great gift for Christmas, for both the young and the young at heart. 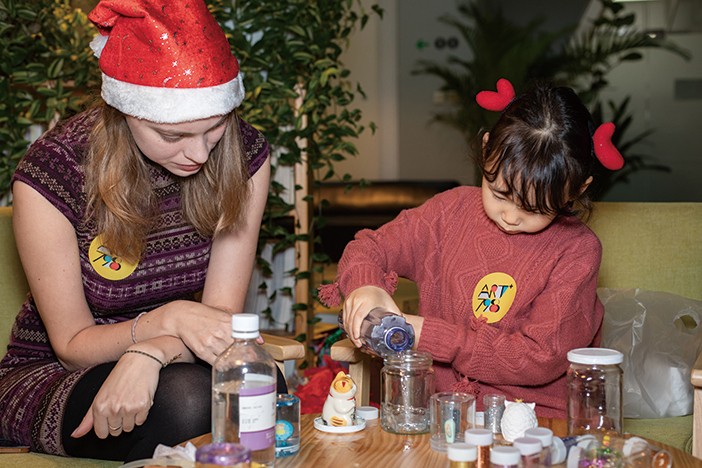 Our 6-year-old maker, Kim Ju Ah, along with her art teacher, Veronika Kotova from Art+798, gave an impressive demonstration of how to make your own snow globe, using Kim’s favorite Hello Kitty figurine as a centerpiece. All the materials are easy to get, and almost any jar works for this project, so wash out your empty marmalade or olive jars, and follow our step-by-step instructions below, plus your own imagination, to create a winter wonderland in your jar! Complete with a special date or message, these snow globes make a lovely gift for any recipient. – Paint the jar lids in seasonal colors (white for Christmas for example). Use glue gun to glue the inside of the lid, wait for the glue to dry before putting the figurine in the center. – Add distilled water to the jar, filling it almost to the top. Add shimmering powder of whatever color and amount you’d like, and a few drops of glycerin according to the jar size. Use a stick to stir and make the glitter float instead of sticking to the bottom. Add ornament tips to the figurine for more decoration. – Screw on the lid tightly (be careful not to dislocate the figurine). Turn the jar over and give a little shake, and enjoy the inside snow!